“Bonsai” means a dwarfed tree cultured in a pot. It has an attractive overall shape and with the appearance of age. Our trees are originally from the tropical/subtropical areas of China. It will therefore naturally feel comfortable in your living room. The valuable Bonsai container, in which this tree is living, is a hand-made Chinese pot. 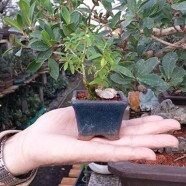 Place it in a naturally bright place but avoid direct afternoon sunlight to prevent withering.Keep in temperature between 50 to 80 degrees F. This indoor Bonsai is recommended to be taken outside occasionally so it can “take a breath of fresh air”, but ONLY when the outdoor temperature is within the previously mentioned temperature range and NOT BELOW 50 F.
Water (pour, not spray) the soil and spray the leaves daily. Make sure the soil is NEVER completely dry. Prune off new growth regularly to keep the tree small and maintain its original shape. In Autumn, the bonsai tends to loose some leaves. However, the leaves will grow back in spring. WE WISH YOU THE FULLEST PLEASURE WITH YOUR NEW BONSAI!